The end of the year can be a time to reflect on mortality and dreams that may or may not come true. To be 90 years old, on the front porch in a swing with my husband, watching my kids and grand kids play on the front lawn, all healthy and happy. My kids will learn to read, run, play and make friends. My kids will graduate high school, college and get a good job. My kids will find someone to love and get married. My kids will have kids and they would have this dream for their kids too. It isn’t my dream really, it is everyone’s dream. I wish there could be a guarantee of some kind, to make sure that all of this will happen, but there isn’t. And I know that there are parents and kids who don’t get all of this and who live great lives and there is love and value and hope in their lives too. But I still want the dream. 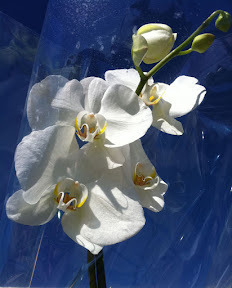 When Blue Eyes and I were in crisis several years ago, some one left us an orchid on our door step without a note. It seemed like it was from everyone, that the universe was thinking of us in some way. Today, I left an orchid on the doorstep of my friends who are in crisis now. I hope they feel the same. I wrote the other day about how some people think Sparkles and Buttercup look like twins. I said one of the reasons is that they both have the same pretty blue eyes. This brings up another awkward conversation I have about my girls with people I have just met. Sometimes they say “Oh, my, they BOTH have such pretty blue eyes!” Then they look at my brown eyes and I can see the math going on in their head. Blue Eyes has, well, blue eyes, but even then, what are the chances of the two of us having two blue-eyed kids? I just smile, when I get that look. But for y’all, since we have known each other for a while, I’ll let you know that my girls are donor egg babies and our donor has blue eyes. So the math isn’t that hard after all. There was a deep sadness about that, when we found out we were very unlikely to get pregnant with my eggs. That I would never see my own features in my child, my own way of walking, maybe just an expression. I had a friend who was adopted. He met his birth family for the first time when he was in his forties. He said he knew instantly that he was related to them because they shared physical traits and subtle mannerisms. It was comforting for him to have found that connection. I won’t have that connection with my girls. There will be other connections, but not genetic ones. I catch myself sometimes, like when one of them likes a food that I like, then I remember that she couldn’t really have gotten that from me. But they instinctively reach for me when they are hurt and they call me Mommy without needing to understand genetics or math. My girls don’t have my eyes, but they have me. Trick-or-treating at the office when you work at home is strange. I used to work in the office and I know people there, but it has been three years and the people I work with the most are in Minneapolis and India. And I wanted to say, “Yes, Sparkles is a twin, but her twin sister died and I miss her.” Sparkles’ twin, Grace, died soon after she was born. I want to remember Grace, but not all the time when I’m meeting new people. I’m lucky and grateful to have both of my girls, I just wish they didn’t look like twins.